Have you ever heard that Craig Morgan song? I love it. And it's stuck in my head today. I'm going to start a tradition here, I think. I'm going to write one day a week - on Sundays - to tell you guys what I really love about life. I think sometimes I get caught up in the crap, the irritations, the bad things in life. And sometimes I'll read through my previous posts and think that maybe I'm not portraying the way I really feel most of the time: Happy. Thankful. Loved. 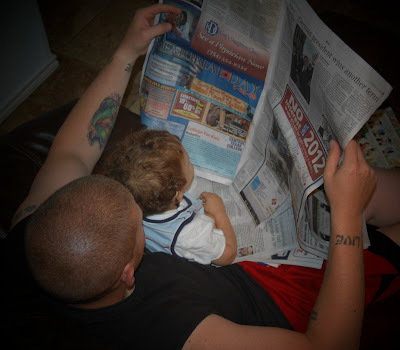 One thing I love about Sunday is watching my boys reading the paper together. 'Cause it's 35 cents off a ground round, Baby. Cut that coupon out! What do you love about Sunday? I love Sundays because they are are relaxing day. We stay in our pjs a little longer than normal and then just take it easy. (Normally a trip to the park and the some ice cream!) LOVE the picture by the way! Too cute for words. I love Sunday because it used to be family day. I love doing family stuff. Now we are empty nest but I have two beautiful grandchildren that I can't wait to do things with. And they have wonderful parents that I love spending time with. In some ways Sunday has turned into another day to do yard or house work just to keep up. I look forward to your next Sunday post. Three weeks from today and you will be spending Sunday with me. Yippie!!!! around here sundays are known as donut days. The boys and I head out to get donuts for them, a fountain coke for me, and a paper for the coupons.